A kibbutz is a collective community in Israel. These communities were established throughout the country after thousands of Jews emigrated to Palestine after the Russian Pogroms of the late 19th century/early 20th century. These Jews are referred to as “the pioneers” because they were the people who transformed the uncivilized land of Palestine into the flourishing country of Israel we know today. The kibbutzim all began with agriculture, as the land of Palestine was completely marshy, barren, and infertile. “Ideologically, the kibbutz [was] based on a utopian-communist notion that [sought] to create ‘a new man’ and ‘reformed society,’ which would realize the values of cooperation and equality, in the spirit of socialism” (Halfin, pg.3). This statement immediately brought the declarations in The Communist Manifesto to mind. Like Marx and Engels, the first kibbutzniks (members of the kibbutz) sought to create a new type of society where all would be equal and free from exploitation. Life at the kibbutzim was based on community. Additionally, one of the most important aspects of the kibbutzim was the limitation placed on private property. “In the first years of the kibbutz all private property was banned — clothes, linens, furniture and utensils — were all part of the communal property and were allotted to members according to their needs” (Halfin, pg. 4). In The Communist Manifesto, it is written, “The theory of the Communists may be summed up in the single sentence: Abolition of private property” (Wootton, pg. 805). The members of the kibbutz would rotate jobs including working the fields, working in the dining halls, working with the farm animals, working with the children, and much more. Every kibbutznik would participate in the daily functions that made the kibbutz run smoothly. “The kibbutz function[ed] as a direct democracy. Th general assembly of all its members formulate[d] policy, elect[ed] officers, authorize[d] the kibbutz budget and approve[d] new members. It serve[d] not only as a decision-making body but also as a forum where members [would] express their opinions and views” (Jewish Virtual Library). Marx would have most likely approved of this democratic system in the kibbutz because he believed democracy was the road to Socialism, which would eventually lead to Communism. One statement in The Communist Manifesto that I found extremely interesting was the statement, “The bourgeois clap-trap about the family and education, about the hallowed co-relation of parents and child, becomes all the more disgusting, the more, by the action of Modern Industry, all family ties among the proletarians are torn asunder, and their children transformed into simple articles of commerce and instruments of labour” (Wootton, pg. 807). Here, Marx and Engels are declaring that industrialization was responsible for destroying family ties of the proletarians. This is interesting when analyzing the transformation the kibbutzim in Israel underwent beginning in the 1970s. Although the kibbutzim were based on agriculture when first established, in recent decades they began to branch out into manufacturing. 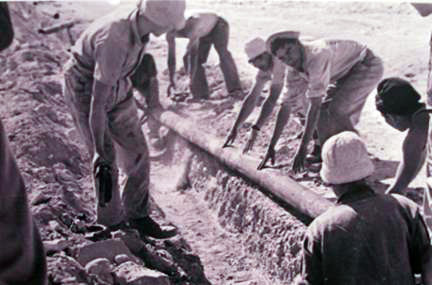 The kibbutz industry is now comprised of manufacturing clothing, irrigation systems, metal work, plastics, and processed foods (Jewish Virtual Library). Today, many kibbutzim are primarily concerned with tourism — housing people from all over the world and hosting a wide array of educational programs for youth and volunteers. During my sophomore year in high school, I lived in Israel for four months. When my parents came for a week to visit me, we went to a kibbutz in the north of Israel and stayed there for two days. During our stay, we were toured around the entire kibbutz and taken to the vineyards because this kibbutz was one of the major wine producers in the country. Although this kibbutz still had members rotating jobs and cooperating as a community, the kibbutzniks had private property and made their own income, which went against the traditional philosophy of the kibbutz. The site of the kibbutz resembled more of a “touristy” hotel than a socialist settlement. This reflects the current state of the majority of kibbutzim in Israel. After closely analyzing the kibbutz establishment, I believe that although the Communist ideologies Marx and Engels advocated for are inherently part of the traditional ideologies of the kibbutz, it is not entirely reflexive of a Communist institution. One major reason for this conclusion is because Marx and Engels rejected conventional formulations of the nation-state, and the kibbutz was a major part of Israeli society. “Before the establishment of the State of Israel and in the first years of statehood, the kibbutz assumed central functions in settlement, immigration, defense, and agricultural development” (Jewish Virtual Library). Thus, the kibbutzim were integral to the establishing of the State of Israel since their inception. I believe the first kibbutzim were built upon Socialist and Zionist principles that called for a system based on communal ownership of property and equality among all members. Modern Political Thought, David Wootton.